The recent wildfires in Woolsey and Camp Fire have Californians and the nation as a whole concerned not only for human life but also for the air that they are breathing. Those living near or in the paths of the fires were and are still breathing hazardous air. And, as the smoke traveled, it caused similar concerns for people living thousands of miles away from the fires themselves. In fact, smoke from the Camp Fire in Northern California rose 20,000 to 30,000 feet, entered the jet stream, and was blown across the country into New England1. It gets you to thinking: when does air quality turn from an inconvenience to hazardous and is it even possible to protect yourself against it? The Air Quality Index2 (AQI), established by the Federal Government of the United States, tells us how clean, polluted or hazardous our air is. The AQI is measured on a scale of 0-500. The higher the number, the higher the level of air pollution and the greater the risk it poses to your lungs and overall health. An AQI value of 50 is considered to be healthy air, 51-100 is considered acceptable but could cause issues for those with sensitivities to ozone, 101-150 is also generally acceptable except for older adults, children, and those with lung disease, 151-200 is not generally acceptable and could really begin to affect the aforementioned sensitive groups, 201-300 triggers a health alert and 300+ triggers emergency alerts. It’s also easy to intuit that the impact of an air quality rating can be subjective. For example, the ratings are considered reliable for those without any respiratory issues. However, individuals with respiratory diseases like asthma may have trouble breathing at much lower ratings than those without the disease. 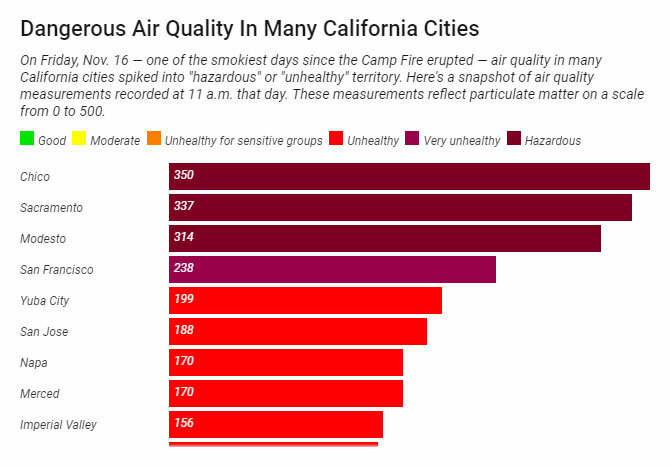 National news outlets3 reported that as a result of the Camp Fire, the AQI reached 246 in Oakland, California and 238 in San Francisco on Friday, November 16th (both values considered to carry health alert status). To give context to those ratings, air quality of 35 to 70 can make it difficult for some people to breath outdoors and a rating of 150 causes recommendations to wear masks outdoors. Breathing in even a little bit of smoke can irritate the eyes, nose and throat. It may cause nausea. If high levels of smoke are inhaled, it can change lung function and make it more difficult to breathe, worsening respiratory conditions like asthma and chronic obstructive pulmonary disease (COPD). As the body breathes in the carbon monoxide from smoke, the oxygen supply in the body decreases, causing symptoms that can range from headaches to heart conditions.5 Generally, these symptoms ease after a couple of days after exposure to the smoke has ceased. If you live in an area that is prone to wildfires, the Environmental Protection Agency (EPA)6 recommends creating a “clean room” in your home. You and your family can use the clean room while the air quality is hazardous. Choose a room with few windows and doors. Buy a portable air cleaner you can use in the room. Make sure it is sized for the room and that it does not make ozone, which is a harmful air pollutant. The EPA7 has detailed guidelines that will help you buy the right model. Portable air cleaners can be used along with window or central air conditioning systems. If you have an air conditioner, run it with the fresh air intake closed to keep outdoor smoke from traveling indoors and use high efficiency filters. Do not use gas, propane, or woodburning stoves, fireplaces, or candles. Never use natural gas or gasoline-powered generators indoors. Do not use spray cans. Do not fry or broil meat. When the external air quality improves, open the doors and windows to air out the house. If you live in an area that is prone to wildfires, it may also be a good idea to have a supply of N95 respirators on hand for the adults. Only N95 respirators will protect your lungs. The EPA warns that dust and surgical masks do not provide protection. Neither does breathing through a wet washcloth. N95 respirators are effective for adults only. They are not built for children and do not fit closely to their faces.